Hi everyone, I have a special guest today! 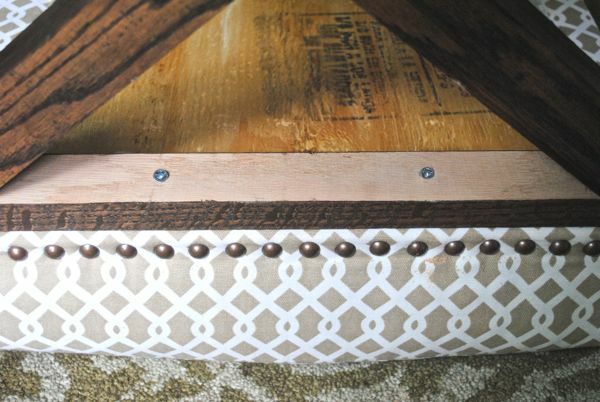 I love a great DIY project, especially this one that combines power tools, beautiful fabric, and nailhead trim to create a custom X leg bench (or ottoman) for extra seating or staging around the house – X base furniture is a favorite of mine, offering a stylish alternative to straight legs, and the smaller upholstered benches look especially fantastic at the end of beds. Today, I invited Jennifer of The Chronicles of Home to share her technique on how to make your own X leg bench. “Hello CG readers, I’m so thrilled to be guest posting for Kate today, on one of my all-time favorite blogs, while she’s on vacation! 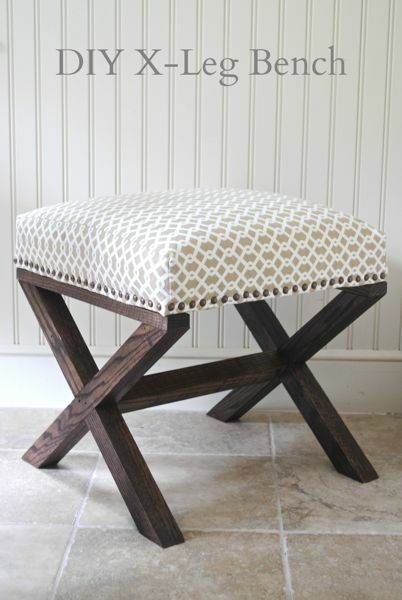 And perhaps equally excited to be sharing a tutorial with you on how to make this cute X-leg upholstered bench. 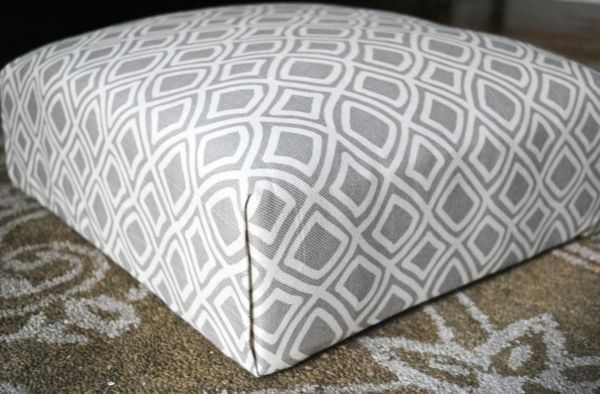 Whether you call them X leg stools, X leg ottomans, or X leg benches, they’re extremely versatile pieces that can be used for extra seating anywhere you need it because they’re so lightweight and moveable. They can be stored away against a wall or under a table when not in use, grouped around a coffee table, used as a coffee table alone or in a pair, or grouped at the bottom of a bed. The possibilities are practically endless! 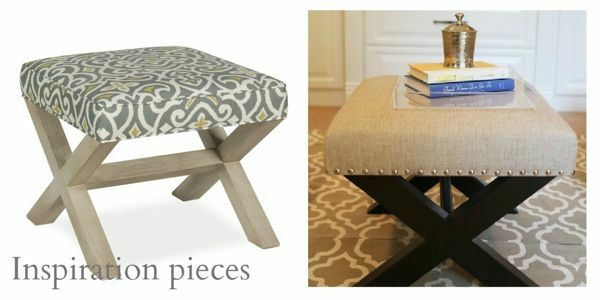 I liked the chunky legs on the bench at left and the streamlined, nailhead-studded top of the one on the right. I tend to be a visual thinker so took an old piece of cardboard and drew a sketch of the finished piece. I’d recommend doing the same so you have a reference to be sure your angles are cut correctly. Do keep in mind that the angles given here will work for these measurements, giving you a finished X-leg bench that is 17″ square and 17″ high. You can change the length of the bench from one X-leg to the other without needing to make any angle changes but any shift in the width or the height of the bench will alter the angles needed to make everything fit together properly. 1 1/2″ x3/4″ oak hardwood planks – cut one end at a 50º angle. Measure 9 1/2″ from the pointed side and cut the other end at a 9º angle. Do this process eight times, giving you eight identically-cut pieces of wood. 1 1/2″ x 3/4″ oak hardwood planks – cut one end at a 50º angle. Measure 19″ from the pointed end and cut the other end at 50º as well. Do this process four times, giving you four identically-cut pieces of wood. 1 1/2″ x 3/4″ oak hardwood planks – cut one end at a straight angle. Measure 17″ and cut the other end at a straight angle as well. 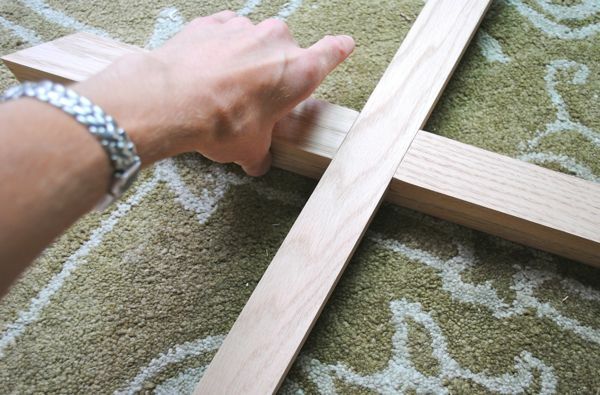 Do this process twice, giving you two identically-cut pieces of wood. 1 1/2″ x 1 1/2″ oak hardwood plank – cut one end at a straight angle. Measure 14″ and cut the other end at a straight angle as well. You only need one piece cut like this. 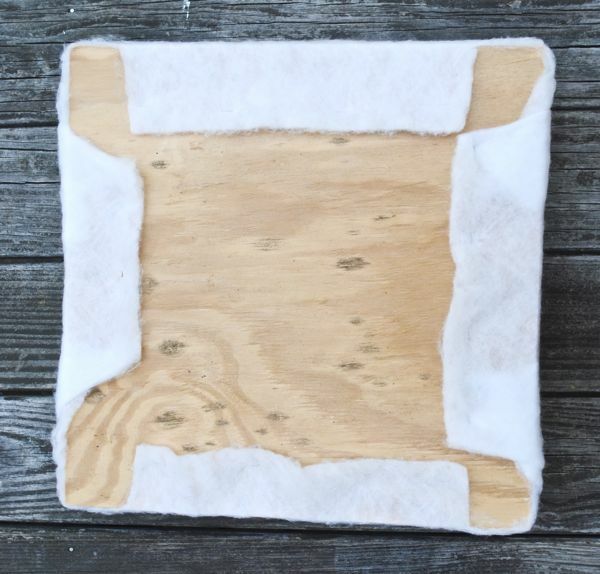 You will also need a piece of 3/4″ plywood cut to a 17″ square, 4″-thick foam cut to 17″ square, at least a 30 1/2″ square of cotton batting, at least a 30 1/2″ square of the fabric you want to use to cover the top, wood glue, wood stain, upholstery nails (I used 88 nails purchased from Lowes), a staple gun and staples, 1 1/4″ and 2 1/2″ finishing nails, and 1 1/2″ wood screws. I needed four 6′-long 1 1/2″x3/4″ oak planks to make the first three groups of cuts above. Once the wood is cut, use sandpaper or a pad sander to sand it down. Lay one of the 19″ pieces on the ground. Lay one of the 9 1/2″ pieces on top, lining up the ends, to determine which sides will be facing each other. Spread wood glue on the bottom side of the 9 1/2″ inch piece and press into place on top of the 19″ piece, fine tuning the positioning so all edges line up exactly. Lay another of the 19″ pieces on top, perpendicular to the 9 1/2″ piece, and repeat the wood glue and positioning process on the other side with another of the 9 1/2″ pieces. Check them after 10-15 minutes to be sure none of the wood has slipped. Do this same thing with the other two 19″ pieces and two more of the 9 1/2″ pieces. Let the glue set up for 30-60 minutes, then carefully flip the glued Xs over and follow the same process with the remaining four 9 1/2″ pieces. Also add a dab of glue in the center notch where the two pieces fit together. Let the glue dry fully overnight. Once dry, hammer three 1 1/4″ finishing nails down each length of the 9 1/2″ pieces and into the longer leg. 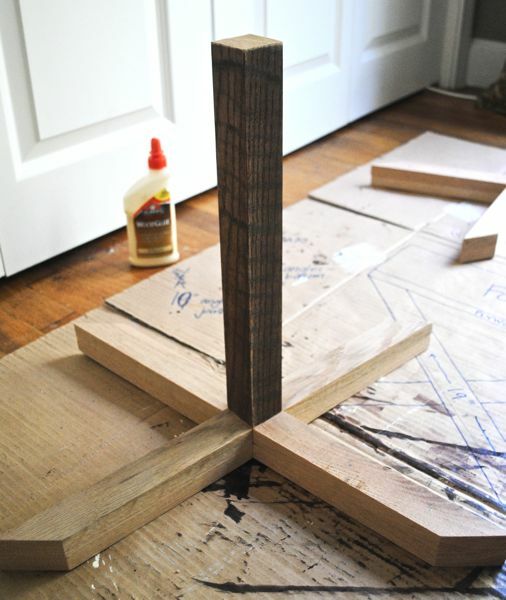 Lay one of the Xs on the floor and put a dab of wood glue in the center. Position the 14″ piece of oak in the center and let dry 30-60 minutes. Carefully place the other X on top of the 14″ piece. And then very, very carefully, pressing the X’s together, place the legs on the floor as they will stand when finished, to be sure everything is lined up properly. Then again very, very carefully, flip back to vertical to allow the glue to completely dry. The positioning part is very important or you could be left with a wobbly, uneven leg base. 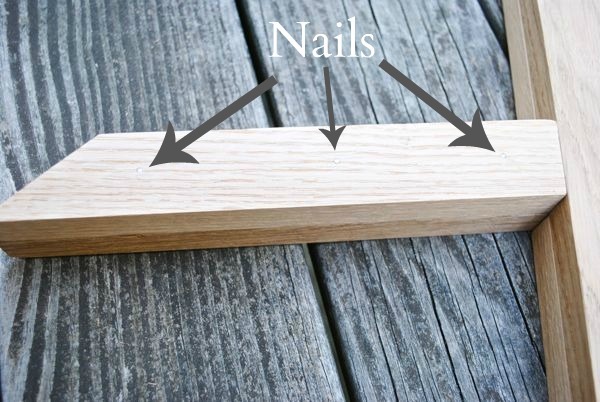 When the glue has dried completely, hammer two 2 1/2″ finishing nails through each outside X-middle into the center piece to strengthen the bond between the X-legs and the middle piece. 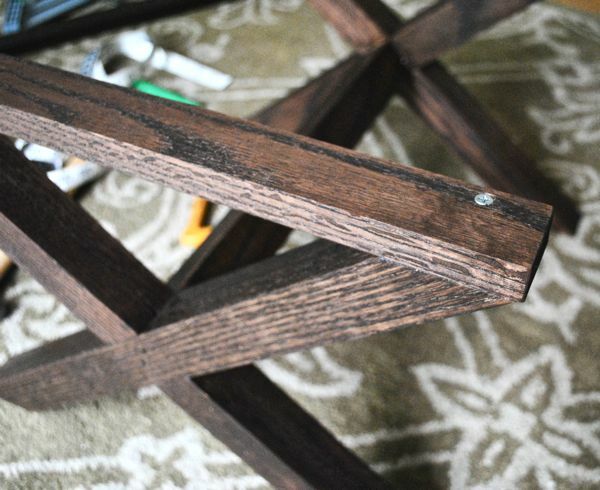 Then stain the wood using the stain of your choice (don’t forget to stain those two 17″ straight pieces!). For this bench, I used Minwax oil-based stain in Kona. To make the top, lay the batting on the floor, then center the foam and plywood on top. 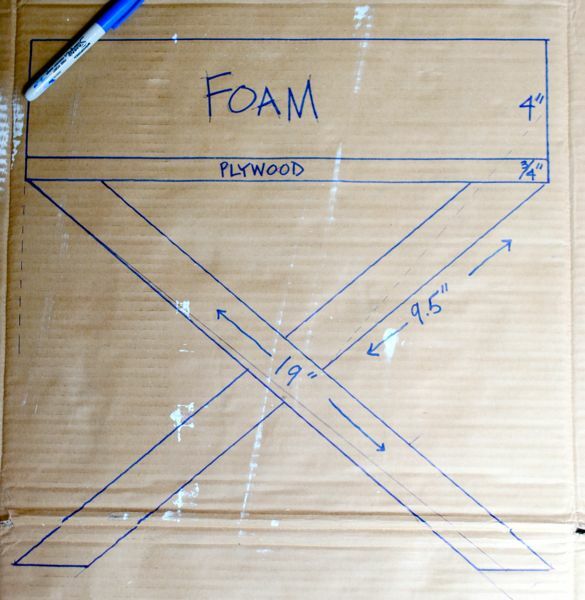 Wrap the batting snugly around the foam and plywood, a bit like wrapping a present, and staple to the plywood. I’m going to deviate a bit from my actual process here and make a different suggestion for making the cover. If you’re a confident tailor, by all means, sew a cover for the top. I’m a semi-confident seamstress and chose to sew the cover but afterwards thought it would actually be much easier to have done a no-sew cover. To do this, you lay your fabric down on the floor, back side facing up. Lay the batting-wrapped seat upside down on top of the fabric. 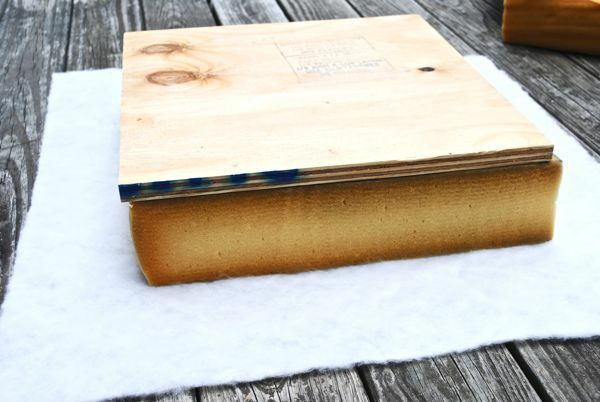 Pull the fabric up over the box on one side rather snugly and staple to the plywood a few times in the middle, leaving the edges unstapled for now. Repeat for the side across from the one you just stapled. Then play with tucking and folding the edges until you get a smooth, flat, folded edge. You can press a warm iron on top of the fold when you have it a way you like to press the fabric even more flat. See the below picture from a previous reupholstery job for an example of what it should look like. Once you have the folds as you want them to be, finish pulling the fabric underneath and stapling to the plywood so all is secure. Flip the seat over and, using a ruler, mark dots 3/4″ apart, ensuring they’re an even distance from the bottom of the seat. 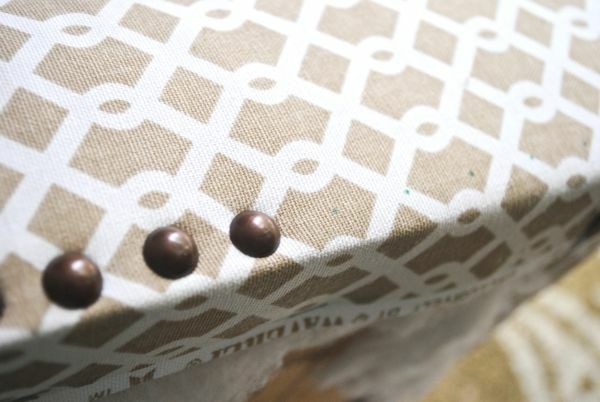 Hammer the upholstery nails on top of the marked dots. Place one of the 17″ straight-cut pieces on top of one of the X-legs and position so the ends are flush. Holding tightly, pre-drill small holes to make sure the screws go in straight and everything lines up. Drive a 1 1/2″ wood screw through each pre-drilled hole, one on each end, then repeat on the other X-leg. The final step is laying the assembled, covered seat upside down on the floor, carefully positioning the X-base upside down on top of it, and pre-drilling a couple holes at a slight angle in the middle of each 17″ piece, now attached to the X-base. Drive a 1 1/2″ wood screw through each hole, and repeat on the other side. Flip it over, and have a seat or prop your legs up! Thank you Jennifer for sharing your beautiful piece with us today. 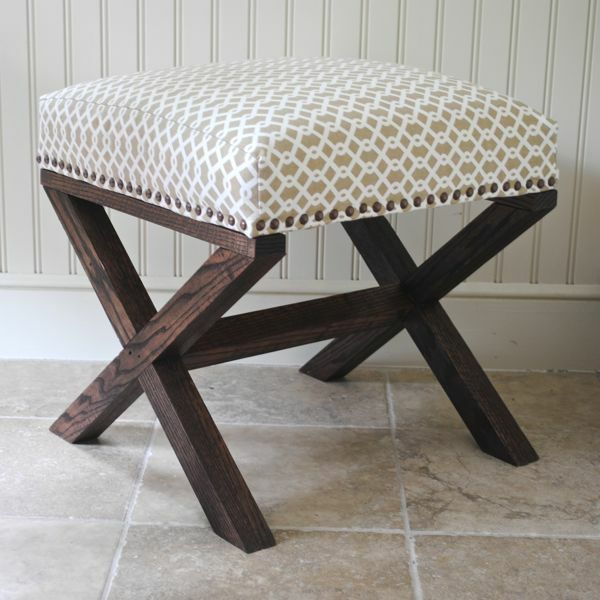 What say you readers, do you have a place for an X leg bench in your home? This looks like something I could actually do. Thanks for such detailed instructions…I can’t wait to get started. OMG, I’m going to make four of these and replace my bench. I love this – it’s beautiful. I’m curious as to how much all of the materials cost? Wow, that turned out absolutely beautiful!! This is gorgeous! I think they make such great accent pieces and I will be putting it on my to-do list for sure! Umm, love this! Pinned for later, for sure! Love it! Thanks for sharing this great tutorial. Stunning!! Great work!!!! I may have to attempt to recreate this ;) Thanks for the inspiration!! Allison is right. This project is not structurally sound, at least not for holding any sort of weight (like a person). The short pieces of each X need to be attached to the longer pieces of the X with more than just wood glue, or else eventually the whole structure will collapse when weight is put on it. That said, it’s really, really pretty and these plans are a great start for how to build an X bench! Rayan over at The Design Confidential came out with this plan a few weeks ago actually. Great job! Love it, what a great DIY! Gorgeous! Yes, I have a place for it in my home! I have never built furniture but I’d love to give this a try! Thanks for sharing! Thanks for all the nice comments on the X bench. Just wanted to address a couple of the comments above in case some others have similar questions or concerns. Regarding the cost of making the bench, the wood for the base cost around $17 and the fabric was $10/yard and I used less than a yard. I had everything else left over from other projects but believe you could make the whole thing for under $50. As far as how sturdy the bench is, we’ve been sitting on it for a few weeks now and it’s as sound as can be! 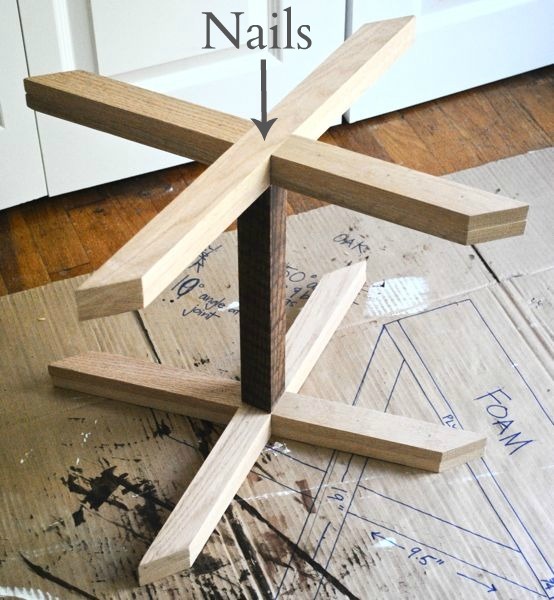 The use of both wood glue and nails in constructing the base doubles the strength and the puzzle-y way the pieces fit together naturally adds support. I can push, rock, and shake mine and it doesn’t budge. Please forgive the remedial question, but how did you get your angles at 50 degrees and 9 degrees? Do you use a mitre saw, mitre box, measurements, etc? Also, what fabric did you use? Love the pattern. Rayan’s bench is similar, but not exactly the same as this one. Looks like we have two options now! Love.. love it! I’m totally going to try this. Thanks! This would be perfect for my closet. Nice job. Love this. Can you tell us where you got the super cute fabric? Thanks! Beautiful bench-beautiful tutorial! Thank you. I love how chunky the legs are and the simplicity. I bought two of these at K Mart and need to cover the original fabric. I am going to make yours for my daughter’s home. Again, thank you. Thank you for sharing this tutorial! This project seems super doable! Wow! Great job! I actually found one at Ross during my lunch hour the other day for $24.99 + 10% off since the fabric was torn a bit on the legs. Fine with me bc I want to change the fabric anyway! I am so doing this! What an awesome project! Great work Jennifer!!! I love your bench! For those of you asking about the fabric, I bought it online at Fabric.com. It’s made by Waverly, the pattern is called Ellis, and the color is Hemp. They also carry it in other colors. Just to be clear regarding the structural questions, I didn’t use just wood glue for any part of the base. Every time I used wood glue, I let it dry then reinforced it with finishing nails. Each X has a total of 12 nails supporting the legs (see photo where there are arrows pointing to here they should go). The bar across the middle is glued to the X’s then two 2 1/2 nails were driven in each side to help ensure strength. It absolutely holds the weight of a person. @Haley – I used a miter saw to make the angle cuts. Though I imagine you could also carefully mark off the angles with a protractor and cut with a jigsaw! That’s a great looking bench. I love the fact that you can make it without having to sew anything. @Starr The photos of the finished bench were taken on my kitchen floor, which is a ceramic tile! I have been looking for the perfect bench for my master bath. Never did I imagine I could make one! Thanks for the instructions, I think I may actually try this! thank u so much for sharing this with us. im doing this for sure! how much did the entire project cost? What a lovely bench! Where did you buy the foam? found you via Lo and Behold and love your blog! i’m your newest follower!!! I’d love if you’d like to check out my blog over at vivid hue! Thank you so much! I am in love with these and whenever I see them here in Australia they are ine excess of $500 each. I really dont have $1000 to spend on these two items so I am using your guide to make my own (with my talented husband’s help). Once again thank you thank you! Well done.